Kumasi’s entertainment stalwart, Homeproud and Ash Cell Limited is set to bring another fun night in the lives of the people of the Garden City of the Ashanti Region, Kumasi in an all musical concert dubbed “All Stars Revolution Concert”. 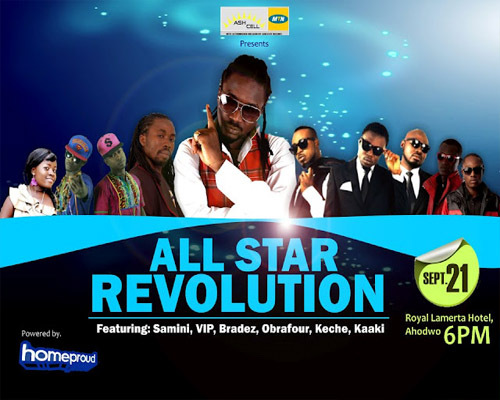 The event which is scheduled take place on the 21st of September 2102 at the Royal Lamerta Hotel at Ahodwo will see performances from top notch artistes such as 2006 MOBO Award winner for Best African Act and 2009 MTV Africa Music Award winner for Best Performer, Samini, platinum ‘Pae Mu Ka’ hit maker Obrafour, Former Stars of the future contestant and Ghana’s first lady of dancehall music Kaaki,the Nima boys who have over a decade entertained music lovers with their energetic stage performances, “Aluguintugui” hitmakers, Keche and 2010 Most Popular song of the year award winners at the Ghana Music Awards, Bradez. Although, the event is meant to entertain patrons and eliminate the boring life in the city, competition is already brewing in the various artist camps as to who will “steal” the show on the night which is making all artistes prepare for spectacular performances. Kaaki, who could not hide her joy in a voice endorsement promises to give a wonderful package as this is her first show in the city. According to Media Relations Officer of Homeproud entertainment, Ebenezer Donkoh, the said date was well thought of since it happens to be a public holiday and assured patrons to expect nothing but their monies worth on the night. For more information and sponsorship, kindly follow Homeproud via twitter @homeproudent or contact +233 244 652244 .